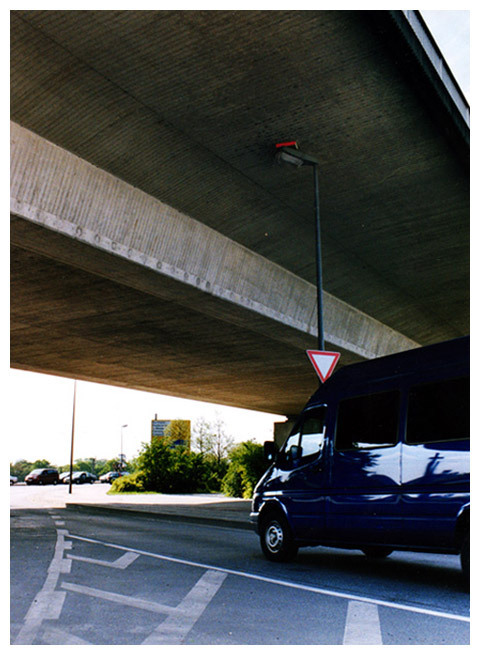 Martin Flemming climbed up the 8 meter long streetlamp on a ladder to measure out the distance between the highway bridge and the top of a streetlamp, which is 8,3 cm. After measuring he has produced an empty book, size 8,3 x 44 x 34cm, put it in the gap between bridge and lamp and shot a photo of that situation. He produced a second book. This book - fitting exactly, so it can not be opened - is containing a photo of itself in that given situation. So it is impossible to see the photo but possible to see what is on it, if you are standing under the bridge. If the book is taken out by anybody, the work is eliminated.